Now trending in an ice cream case near you: fruit and vegetable ice pops—all natural, dairy free, gluten free, fat free and packed with vitamins A and C. They’re a better for you option for a sit-down snack or on-the-go refreshment on a hot summer day. From major producers like Outshine (from Dreyer’s) to mom & pops like Ruby Rockets, recipe developers are combining vegetables and fruits into frozen snacks that support attempts to get kids and others to eat more veggies. Are you really getting your daily allotment of vegetables through ice pops? Not really. Neither company claims that you can substitute an ice pop for a half serving of vegetables. But there’s an important idea here: If you look for ways to add more fruits and vegetables into your diet, you’ll find them, and they’ll add up (Outshine offers tips below). The government recommends 10 one cup servings a day of fruits and veggies (double the portion if it’s leafy greens, halve the portion if it’s dried fruit). Don’t do it for them; do it for you. Here’s the full story from the Harvard School Of Public Health. 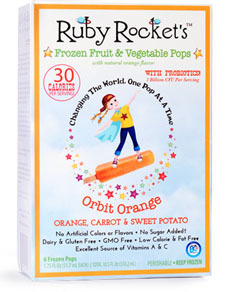 Targeted to moms who want healthier options for their families, Ruby Rocket’s pops are low calorie, better-for-you options for everyone. Photo courtesy Ruby Rocket’s. Galaxy Green gets its green on with kiwi, avocado, spinach and lemon, for 35 calories per pop. Orbit Orange combines organic oranges, sweet potatoes, carrots, lemons and strawberries, for 30 calories. Rock-it Red is a blend of beet, carrot, lemon, strawberry and sweet potato, just 25 calories. Just slightly sweet—all from the natural sugar in the fruits and vegetables—and with so few calories per pop, they are truly guilt free. Those accustomed to normal sweetness levels will notice the missing sugar. But, like cutting back on the sugar you add to a cup of coffee, you may find that you’re just as content without it. 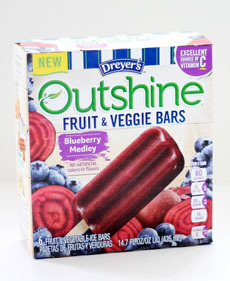 Following Outshine’s successful launch of frozen fruit bars, the new Outshine Fruit & Veggie Bars line blends fruits and vegetables. With the majority of flavors, the vegetable components are not highlighted on the box (perhaps so vegetable-avoiders won’t turn away?). The bars contain at least 25% vegetables. The line is certified kosher by OU. Learn more at OutshineSnacks.com. Start your first meal off right. Ditch the morning donut for scrambled eggs mixed with onions, peppers, and mushrooms. Or boost your oatmeal or yogurt by stirring berries and bananas. Hold the bread. Add some crunch with a lettuce wrap. Instead of bread, make your next sandwich or burger inside a leafy green. Stack 2 or 3 large, leafy greens such as vibb lettuce, romaine, red lettuce, cabbage, or radicchio, and pile on the fixings. Keep produce top-of-mind. Make fruits and vegetables the easiest and most convenient choice for your next snack. Keep a bowl of fresh fruit on the counter at home or on your desk, keep dried fruit in your car or purse for when you are on the go, and always be prepared by packing pre-cut fruit and veggies into snack-size bags for perfectly-portioned munchies. Get creative with greens. Salads don’t have to be boring with just plain lettuce and dressing. Get inspired and load your salad bowl with at least five different ingredients: spinach, avocado and other fruits, nuts, seeds, etc. Go savory. A plate of raw vegetables can look uninspired. Add life with good for you hummus, salsa or yogurt dip. Veggie chips. Trade the potato chips, tortilla chips and pretzels for kale chips or other veggie chips. (Note that nutritionists consider potatoes a starch, not a vegetable). Veggie fondue. Switch the bread for raw and/or cooked vegetable dippers. Salad pizza. Our local pizzeria makes a “salad pizza” with 11 different vegetable toppers (and an optional whole wheat crust). Gratins. Roast or steam veggies,than add a shredded mozzarella or cheddar gratin. Cheese makes [almost] everything taste better. Carrot and zucchini muffins. Make your own, and double the amount of veggies in the batter. You can have your veggies and still have fun, too.